Milan Kundera, the great Czech novelist, mentions in one of his works that a nation or society that has no folk tales, folk dances or folk festivals is a spiritually dead nation. In that sense, our nation, India is spiritually vibrant as it is a paradise of folk festivals and dances. Among these, there are a few that still retain a pastoral flavour and evoke an intense wistfulness that inexorably connects one to the village one grew up in. For me, one such festival is 'Thiruvathira'. Thiruvathira is celebrated on the star ‘Thiruvathira’ and it falls on a full moon day in the month of ‘Dhanu’-the fifth month in the Malayalam Calendar (December/January). Thiruvathira is perhaps the only festival, other than Karva Chauth, that I know is exclusively meant for the women-folk in India. From ancient times, the Malayalee women enjoyed an enviable position in the society, and to a considerable extent influenced the social structure, customs and religious practices. The culmination of this phenomenon is clearly visible in this great festival which was earlier confined to the upper classes such as Brahmins, Nairs and Ambalavasis (temple professionals). The first Thiruvathira coming after the marriage of a girl is known as Puthen Thiruvathira or Poothiruvathira and it is celebrated with grand gaiety. As per the ancient Sangham Krithi, 'Paripadal' by Nallezhuniyaar, Thiruvathira has its origin around 9th century AD. ‘Paripadal’ has a description of women moving as a group to the Vaigai river for taking a bath. In that sense this festival has an antiquity of about 1200 years. 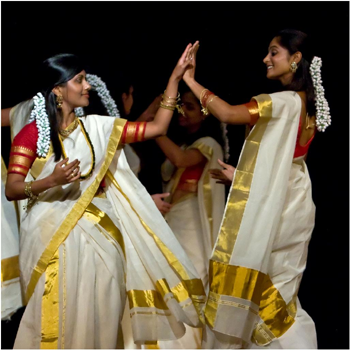 Thiruvathira is celebrated predominantly in Kerala and to a good extent in Tamil Nadu. Legend stresses this festival’s association with Shiva-Parvathi union. Shiva is considered as the perfect male and Paravathi the perfect devoted wife and their matrimonial solidity is an aspect that gives oomph to this festival. Sati, the consort of Shiva was the daughter of Daksha Prajaapati. She had married Shiva against the wishes of her father. When Daksha performed a great yagna “Brihaspathisavanam” she attended it against her husband's wishes and was insulted. Unable to bear it, she immolated herself. Enraged at this, Shiva danced the dance of destruction throughout the Universe. The other gods intervened to stop it. Later, engulfed by sorrow, Shiva went to the Himalayas to perform a fierce ‘Tapas’. Around this time Tharaka also performed a Tapasya and Brahma granted him two boons that he could be killed only by a son of Lord Siva who was seven years old, and that he would be invisible to others. Taraka started ruling the demons as a good king but later attacked Deva loka and soon conquered the three worlds. The Devas fled heaven and went to Brahma to appeal for help. Brahma said to the gods, "O Devas, I cannot destroy Taraka. But let me give you a suggestion. A girl named Sati Paravati will born to the King Himalaya and his wife Queen Mena and she will be a great devotee of Lord Shiva and will dedicate herself to Shiva undergoing Thapas to get him as her husband. Get the help of Kama Deva , the God of Love. Induce him to tempt Lord Shiva, who remains absorbed in His Yoga Samadhi. Let Lord Siva unite with Parvati. A powerful son, Lord Subramanya, will be born to them. This son will destroy the demon that harasses you." Indra, the chief of the gods, thereupon requested Cupid (Kama Deva) to go with his wife, Rati, and his companion Vasanta (the season of spring), to Mount Kailas, the abode of Shiva. Standing behind a tree, Kama Deva shot his arrow of passion at Shiva, whilst Parvati was placing some flowers in His hands. The moment their hands met, Siva experienced a distracting feeling and fell in love with Parvati . He wondered what it was that disturbed His Yoga. He looked around and saw Kama Deva crouching behind the tree. The Lord opened His "third eye", and Kama Deva was burnt to ashes. However, after burning Cupid, by His Yogic vision, the Lord realized that the birth of Lord Subramanya was absolutely necessary to destroy the powerful Taraka. Siva's seed was thrown into the fire which, unable to retain it, threw it into the Ganges, which in turn threw it into a reed forest. This is where Lord Subramanya was born; hence, He is called Saravanabhava--"born in a reed-forest". He became the leader of the celestial hosts and the destroyer of Taraka as Brahma had ordained. Paravati performed an intense Tapas for her union with Shiva. Meanwhile, Devas lamented the death of Kama Deva as without him, there wouldn't be any matrimony. All the women including Kama’s wife Rati started praying for Siva-Parvati union. After a lot of tests to ensure her genuine devotion to him, Shiva married Parvati on the Thiruvathira day. At the wish of Paravati, Shiva revived Kama to life to delight Rati Devi on the same day. So Thiruvathira celebrates the intense devotion of women to their husbands. Observing Thiruvathira Vrithamm (Austerities) by women is said to bestow blessed conjugal bliss on them and also prosperity, longevity and blessings to their husbands . Nubile girls are believed to be blessed with befitting and devoted husbands if they undergo Thirvathira Vrithum. As with most time-honoured traditions, men are not required to reciprocate for the women in their lives in any way, shape or form. This season is noted by mild cold breezes, pleasant weather, all embracing moonlight, and starry skies. It is considered to give the women folk a lot of inner peace and fill them with a rare sweetness and sensuality. The Thiruvathira Vrithum also known as Ardra Vrithum starts seven days before Thiruvathira on the star of Revathi . From that day onwards, the pubescent girls and married women wake up very early in the morning, march as a group with lit bronze lamps and “Ashtamangalyam’ to the nearby ponds. After placing the lamps on the bank, they plunge into the pond, form a circle and begin the ritual of ‘Thudikottu’ . One of them takes the lead, singing a song pertaining to Kamadeva. ‘Thudi’ songs also invoke images of the bathing scenes of Paravti and her consorts. These songs are simultaneously accompanied by a interesting sound produced on water. The palm of the left hand is closed, and kept immediately underneath the surface of the water. Then the palm of the right hand is forcibly brought down in unison in a slanting direction, and struck against its surface so that the water is completely ruffled, and is splashed in all directions producing a deep reverberating sound. This water dance is known as “Thudi”. Since Thiruvathira also commemorates the death of Kamadeva, this hitting the surface of water with an orientation towards the breast is symbolic of breast beating, lamenting the death of Kamadeva. On every Thiruvathira, one could hear this resonant and rhythmic beat of Thudi all over the village. As a boy I too used to jump into our pond along with my grandmother and mother splashing water. After the bath, the women dress in the neatest and grandest possible attire and visit the nearby Shiva temple to offer prayers and to commence their Vrithum. As Thiruvathira is an auspicious day of penance, women do not take any food containing rice. Instead they have plantain, tender coconuts, tubers etc. This has consequently led to the ritualistic preparation of the famous dish , “Thiruvathira Puzhukku” which is prepared with eight different tubers, also known as ‘Ettangadi’. Traditionally, it is prepared with roots such as koorka (Chinese potatoes), Taro (chembu), Kaachil, elephant yam (Telinga potatoes), Tapioca, Red beans, Potatoes, and garnished with coconut oil, cumin powder and curry leaves. I think this dish has a fertility myth associated with it as a majority of the vegetables used are tubers that grow beneath the ground or the womb of the earth. Another belief is that through this ritual of preparation, Kamadeva’s body represented by the tubers is regained. After a leisurely lunch, women chew betel. Among Namboodiris, Ambalavasis, and high class Nairs, there is a convention that each woman should chew 108 betel leaves. Then they move as a group for the Oonjalattom (swinging on an oonjal or swing). Though this swinging is an important item of amusement, it is said that it typifies the attempt these women make in order to hang themselves commemorating the demise of Kama (Cupid). During this season, huge swings would come up in the backyards of most of the houses, on trees like the mango tree, jack fruit tree etc. Often, the strongest vines were tied on to two huge coconut trees, and from that vine was suspended the swing. In my childhood, the swings were made of coir ropes. The seat would be rough hewn: the wide end of a coconut palm leaf stem, cut to the required size. Often, with a strong push, the swing would go so high that the seat and the person on it would veer in another direction. And then, the vines would get intertwined. One would have to go round and round till the swing stopped moving. It was adventure sport of a different kind. Often, it was not confined to sitting but standing on it. Shouting out a rhythmic ‘Aarpo, iyyo, aarpo iyyo..’ while on the swing added to the festive feeling. 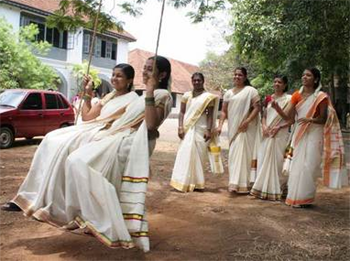 The swing is one Thiruvathira motif that’s missed by people nowadays, particularly the city dwellers. Once the dusk sets in, the ladies in the neighborhood assembled in the central courtyard and placed a tall bronze lamp (Nilavelakku) and an image of Shiva with some flowers, plantains and jaggery on a banana leaf as offering to the deity, in the centre. Then begins the dance called Thiruvathirakkali or Kaikottikali. They would be neatly attired in a gold bordered traditional two piece dress called Mundu and Neriyathu. A Mundu is a one piece cloth draped on the lower part of the body while Neriyathu is worn over a blouse. The hair would be tied in a bun with a fragrant jasmine garland around it to enhance the charm. They would stand in a circle around the lighted lamp and dance as per the rhythm of the songs, often pirouetting and moving in a clockwise and sometimes in an anti-clockwise direction, gracefully bending sideways, as they sing. Dancers also beautifully co-ordinate their hand movements as they go clapping their hands upwards and downwards in rhythm with the beat. The dance is celebration of marital fidelity and the female energy, for that is what brought Kama Deva back to life from ashes, and is performed to gain everlasting marital bliss. This sinuous movement executed by the group of dancers around the ‘Nilavilakku’ embody lasya or amorous charm and grace. Today Thiruvathira dance has become a popular item for all occasions and is an integral part of School and University Art Festivals in Kerala. The Thiruvathira dance would continue past midnight as women were not supposed to sleep during Thiruvathira night to obtain full ‘Vrithum’ benefits. The dance would be interrupted by "Pathirappochoodal" or the picking and wearing of ‘Dashapushpam’(Ten sacred flowers) at midnight. They are worn with an intense remembrance of their husbands. The dance is then continued till early morning when it is stopped for ‘Ardhanareeshwara’ pooja. After this, the women go for bath and prayer in temple. The Thiruvathira Vrithamm comes to a finale upon drinking the “Theertham” (holy ablution water). My eyes well up when I think of the innumerable folk festivals of ineffable charm and allure that are losing their rustic charm and fading from our collective memory. I believe that no human being can impart true grace and meaning to his existence if he delinks himself from his cultural myths, symbols and heritage. Will Thiruvathira mean anything to our women folk fifty years hence? I wonder. Such a nice article with the stories, details, analysis and at the end the date for this year. Thank you! i even wonder will Thiruvathira mean anything to our women folk fifty years hence ..
Have shared this article on my blog page. And so how have you been?